This book is a fully documented historical work that identifies in a easy-to-understand manner just who the people were who originated the world's religions. It concentrates specifically on a particularly prominent people mentioned both in the Old and New Testament (who were very important in the time of Christ and the apostles) but are practically unknown today by most people. Even historians and theologians seldom mention the impact that these mysterious people have had on the development of Western Civilization. Dr. Martin has produced a major historical study that all wishing to understand the present political and religious environment of Europe should read. 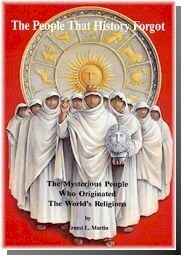 This book takes away the curtains of mystery that have surrounded peoples over the centuries. For the first time, you will read about certain important European national groups recorded in the annals of history who have all but disappeared in the textbooks today. You will discover who the people were who settled much of southern Europe and gave us our type of Christianity that we witness in the world today. Indeed, this book gives a modern identity of an ancient people who are as important in historical and biblical matters as those who wrote the Dead Sea Scrolls. This is one book that all people interested in prophecy, doctrine and history should have. Potential markets for this book include historians, professors, theologians, Bible teachers, anthropologists, Bible students interested in history and prophecy, pastors and students of southern Mediterranean history.